The state-run Xinhua news agency said the requirement for China's president and vice president to serve no more than two consecutive terms was removed from the constitution. "Xi is obviously behind the move to remove the current two-term limit," said China expert Steven W. Mosher. "This will allow Xi, like Mao Zedong, to stay in power as long as he lives." Former State Department China expert John Tkacik said China's powerful PLA supported Xi's action based on worries about leadership succession in 2023, when Xi would have ended his second term. "For the United States, the idea of an absolute dictator running the most powerful peer competitor nation-state-and soon to be the most powerful economy—with a single-minded obsession to ‘Make China Great Again' who is going to be around for another 10 to 15 years must give us pause," Tkacik said. "Fasten your seatbelts." A Chinese source with knowledge of internal affairs said Xi is the first leader to reside in Mao's residence inside the walled Beijing leadership compound known as Zhongnanhai. In the past, Mao's residence was a museum. Mao's wife, Jiang Qing, sought to perpetuate the system after his death. She was ousted by reform communist leader Deng Xiaoping who then set limits on leaders' tenure in office. Xi currently holds three power positions: general party secretary, government president, and head of the central military commission that runs the party's People's Liberation Army (PLA). China's vibrant internet responded with a wave of wry commentary as censors struggled to remove what the government regards as offensive posts. "Argh, we're going to become North Korea," said one online post on Weibo, China's Twitter-like social media outlet. "We're following the example of our neighbor," said another post, referring to the communist family dynasty in North Korea in power since the late 1940s. One social media post showed a picture of a condom in a wrapper under the caption, "doing it twice is not enough." A number of phrases used online to mask criticism of the Chinese political system were banned, including "boarding a plane" that in Chinese sounds similar to "ascending the throne." Censors also banned "life-long rule," "long live the emperor" and the title of George Orwell’s novel Animal Farm, Financial Times reported. Mosher, author of the new book, "Bully of Asia," predicted Xi's consolidation of power as supreme leader. 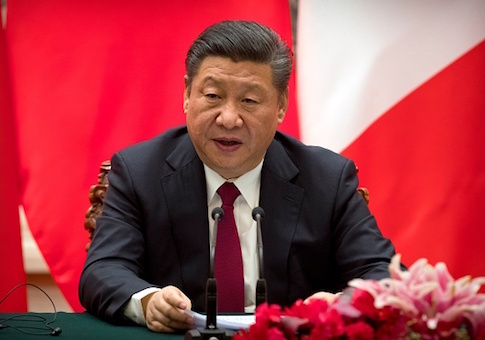 "Core leader Xi Jinping envisions a sinocentric world, with China's borders expanding outward, near neighbors reduced to de facto vassals, and countries further afield humbly serving as markets for Chinese products and sources of raw materials," Mosher wrote. For the United States and the world, Xi's power grab signals greater dictatorial rule in China and increased Chinese aggression abroad, Mosher said. A close aide to Xi, Ding Xuexiang, director of the party's General Office, appeared to justify Xi's further consolidation of power by claiming in a recent internal speech that the party is under assault from political enemies that have sought to "usurp the party and seize power." The congressional U.S.-China Economic and Security Review Commission stated in its most recent annual report that Xi's anti-corruption campaign has produced political uncertainty. Additionally, Xi's crackdown has produced large outflows of cash by Chinese officials and business people who are moving their wealth abroad to avoid government seizures. The capital flow has raised concerns about China's economic stability. "According to China’s Central Commission for Discipline Inspection, in the first half of 2017 more than 210,000 Chinese officials were punished for corruption," the commission report said. Despite cordial meetings between Xi and President Trump since last year seeking common ground, "tensions increased" between Washington and Beijing, the report said. The Pentagon's most recent annual report on the Chinese military says that Xi and Chinese leaders view the first two decades of the 21st century as a "period of strategic opportunity." The Chinese under Xi are seeking to expand China's power to perpetuate communist rule, maintain domestic stability, and achieve regional dominance with a modernized military, the Pentagon said. Xi's assumption of new dictatorial power is a setback for some U.S. commentators who thought he would move the country in a democratic direction. New York Times columnist Nicholas Kristof, a China expert, predicted in 2013 that Xi would bring political reform. Kristof wrote in a Jan. 5, 2013, column that change under Xi was coming. "Here's my prediction about China: … Mao's body will be hauled out of Tiananmen Square on his watch, and Liu Xiaobo, the Nobel Peace Prize-winning writer will be released from prison," he said. Liu died in prison from neglect last year and Mao's embalmed cadaver remains an object of veneration at a Tiananmen Square mausoleum. Another Chinese social media outlet, WeChat, was forced to disable the comments section for the official Party newspaper People's Daily, to squelch negative comments about the constitutional change. The overseas edition of People's Daily also was forced to take down an article on the changed leadership term limits, replacing it with another article that did not mention the change. Chinese social media also carried numerous memes of Winnie the Pooh, the fictional bear of the A.A. Milne children's stories that has been used as a surrogate for Xi based on a likeness between the two. As a result, censors banned images of Winner the Pooh in China. "Removing the two-term limit of the Chinese president can help maintain the trinity system and improve the institution of leadership of the [party] and the nation," the newspaper said. The rule changes will be announced during the meeting next month of China's mock parliament, the National People's Congress when Xi's ideology also will be added to the constitution. His version of Chinese communism is called "Xi Jinping Thought on Socialism with Chinese Characteristics for a New Era." Hong Kong analyst Lau Yui-siu said the constitutional changes are designed to facilitate Xi's "life long tenure" as supreme leader and predicted greater struggle for democratic reform. "Xi is taking a rollback step by step, which runs counter to the political civilization of the mankind," Lau told the newspaper Ping Kuo Jih Pao. "If the feudal dictatorship continues to develop indefinitely, the CPC political reform will not be realized in the foreseeable future. Fierce struggle may reappear in the process of China's democratic development." Willy Lam Wo-lap, a veteran China watcher, said Xi believes that only by staying in power can he "stabilize the entire country and put his political platform into practice." According to Lam, Xi seems to have forgotten that "dictatorship ultimately leads to collapse without exception" by suppressing dissent and ultimately producing a disaster. Lam believes democratic forces within that Party and outside of it oppose Xi's power grab and can be expected to launch "counterattacks."